Jay Gruden On What Andy Dalton Needs To Improve: "Everything"
Every morning, the fine folks at Sports Radio Interviews sift through the a.m. drive-time chatter to bring you the best interviews with coaches, players, and personalities across the sports landscape. Today: The Bengals OC says there's always room for improvement. Jay Gruden joined Dan Hoard on WLW in Cincinnati to discuss his interviews for head-coaching jobs earlier in the offseason, the focus of those interviews and where he felt he had the best chance to land. 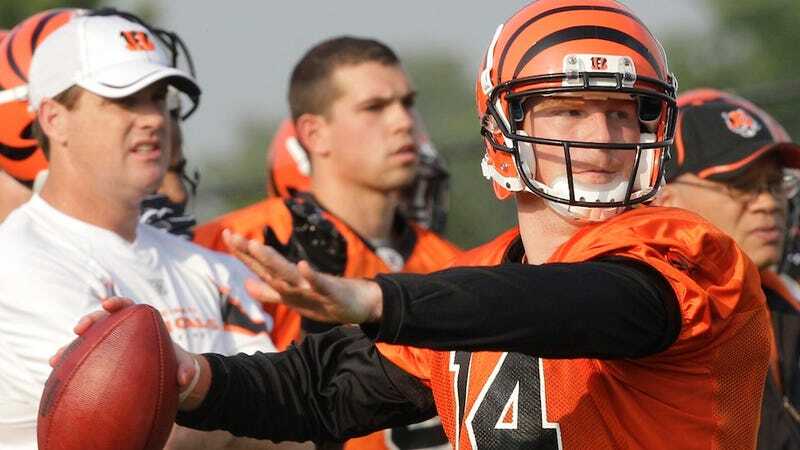 He also touched on the current Cincinnati offense and his desire for it to gain another "playmaker" and noted that Andy Dalton has a lot of improving still to do. "It was a great process, really. It was exciting and it was flattering that these guys would even think to interview me. Says a lot about our offense and how far we've come and Coach Lewis and what people think around the league about what he's done with this program. It was a great opportunity, and I probably went in as a long shot in some of these places and I hoped to do a pretty good job interviewing. And either way, I felt pretty good about coming back here, or getting an opportunity to be a head coach would be great. But I'm happy about the process and happy to come back, no doubt." "I think Jacksonville I felt probably the closest. But once Chip Kelly came into Philadelphia and Gus Bradley freed up, I knew that I'd probably be a long shot. But I think I had good interviews and I felt good about the process and if it ever comes up, if I'm ever fortunate enough to have another opportunity, I'll feel more prepared." "It was not a lot about X's and O's, more about how to run a team and personnel decisions and how to run a front office, and all that good stuff. But it was exciting and it was great to meet some of the owners, the families and the general managers - a lot of young general managers and everybody wants the same thing. Everybody wants a Super Bowl championship. It's not easy to get to it, but everyone has the same goal in mind, no doubt." "It's hard to put your finger on one thing. I think we need another playmaker. We need somebody who can take the ball 80 yards on a swing pass or a handoff or what have you - a little bit of speed. But we're pretty good everywhere, we just need to get our pretty good players and turn them into great players and our great players need to be extraordinary. And we just need to keep pushing the envelope and making sure everybody gets better. But it could be a running back - we have a good running back corps with Green-Ellis coming back. We have good tight ends with Gresham and Orson doing some good things. Our offensive line's pretty stable. A lot will be determined by what happens with Andre [Smith] and if he's a free agent or not. We could use another receiver, but I love the way Marvin Jones came through, and I know we get Sanu back and we've got Hawkins. So we've got a good group of players, we just need maybe another playmaker to add to the mix and get the players that we already have and coach them up better." "Everything. There's not one part of his game that he doesn't need to improve. … Hopefully some of our guys are working out with him and they're throwing. But really, within the offseason, your arm strength, your strength, your footwork, basically your fundamentals of football. And obviously he needs to get better with his deep ball accuracy and touch, and there's not really one part of his game that he can't really improve upon. He has to get better in every phase - scramble ability, foot quickness, accuracy, deep accuracy, short, anticipation. He's got a long way to go. He's done some great things for a second-year quarterback, won a lot of games and thrown some good touchdown passes, but we feel like he has not come close to his potential. That's our job to get it out of him. And he knows he's gotta play better, and we all do." This post, written by Brad Gagnon, appears courtesy of Sports Radio Interviews. For the complete highlights of the interview, as well as audio, click here. • Aldon Smith can't get over that Super Bowl holding non-call. • Proper rest is key for old Celtics. • Larry Brown hates realignment.